Don’t take chances with unreliable and undependable arbor care companies the promise you the world and deliver very little quality. 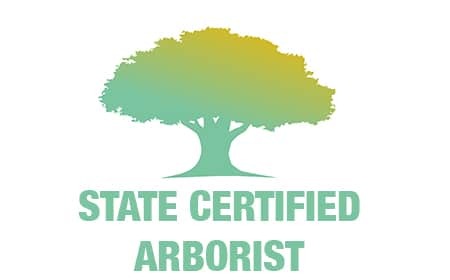 We bring true value to every visitation to your property by bringing you the very best state certified arborist in Fort Worth, TX and DFW. When you call Tree Care Pros we have several trees doctors available to handle whatever situations or concerns you might be facing on your landscape. They will bring real solutions to combating tree disease, and restoring your sick trees back to good health. We offer the latest technology in chemical engineering to combat tree disease and bring back the luster and beauty of your plantation. When you schedule an appointment with one of our professional staff members we will analyze and properly diagnose your trees by taking a simple three step process. One of the best ways to find out if your tree is being stressed by any type of disease is through the leaf system. Premature leaf foliage is a pre-determining factor that your tree is dealing with some type of disease and is in immediate need of a diagnosing or treatment. Let use give you some good tips on how to identify your trees so this way you can prepare an arborist to visit your property immediately. Number one is “season;” knowing the season of natural occurring leaf foliage on your tree species. Commonsense will tell you if your tree has leaf foliage out of the regular season where the leafs are turning yellow, brown or falling from the tree you have a serious issue that needs a mediate attention. Now leaf foliage can happen for many different reasons like under watering,to much watering, leaf scorch, oak wilt, canker, a lack of nutrients in the soil just to name a few. It is important to contact a tree Arbor company at first signs of premature leaf foliage. 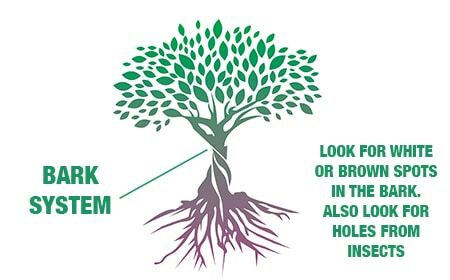 Another key determining factor that your tree are having issues with tree disease is the bark system. Understand that the bark system is the actual skin of the tree just like a human being skin is needed to protect vital tissue from being contaminated with bacteria’s and disease from the elements. If you notice decay in branches could be a possible insect infestation like bores or carpenter ants have infiltrated the vascular system of the tree. Another indication is seeing white spots in bark, peeling off bark, or brown spotting this could be a severe disease called hypoxylon canker better known as tree cancer. This particular disease needs to be treated “immediately” if not it will take your trees health and kill it with any few months. Another factor is if you notice holes on you bark this is also an insect infestation and needs to be treated at first signs. One of our tree experts will help you with any of the mentions disease and be willing to answer any questions you might have. When he comes to your root system on your trees don’t take any chances this is probably one of the most penetrating points of disease. Remember too much water can hurt your trees causing your root system to get soggy too moist and incubating a disease called root rot. Not enough moisture can cause the soil to get condensed and your root system being choked out not allowing it to grow properly. Most trees will start to grow a new root system at this point and this is not good for the over all trees health and life span. Keep in mind that most insect infestation’s will occur at the root flare where is will be hidden from view. It is imperative also to make sure that you have the proper mulch surrounding your root system to protect them from the elements of hot summer months and cold winter season. 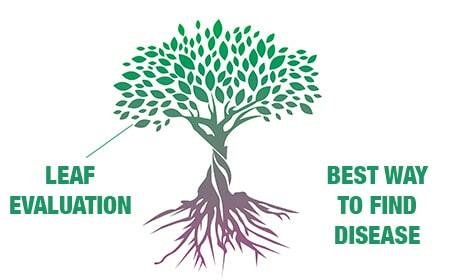 A trained professional arborist will visit your location and using a air-spead tool to blow away a portion of your root system to determine if you have any type of disease operating and also take moisture readings. 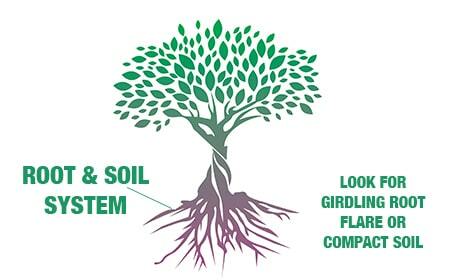 This is the best way to find out if your soil and your root system or compatible with one another. Some soil samples will be analyzed to make sure that all the proper nutrients and balances or correct. This test is fairly inexpensive and should be done at least once a year.